Plenty of people still aren't sure what No Man's Sky is. We know all about the unprecedentedly huge, mathematically generated galaxy, but that isn't enough: people want objectives, and purpose! 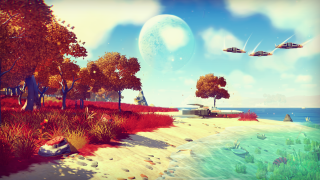 Hearing the demand, Hello Games founder Sean Murray visited IGN to explain some of the more 'game-y' aspects of No Man's Sky. You'll see the results in the video embedded above. Some interesting points: weapons and ships will be procedurally generated, with Murray mentioning "hundreds of thousands" of possible variants. The game's user interface is very Destiny-centric, while mining for resources is as simple as shooting at them. Oh, and alien creatures will headbutt you to death if you're not careful, but you'd be silly to retalliate: robot sentries guarding each of the planets do not negotiate. All the details are in the video above, but the greatest pleasure is just seeing more of the game in action. Personally, I can't wait to do absolutely nothing of consequence in a foreign galaxy.